Preserving your eyesight starts with eating the right foods for staving off one of the most common eye issues—dry eyes. In general, other than receiving dry eye treatments from your optometrist, the best thing you can do to help with dry eyes is to follow a plant-based diet and focus on lowering your cholesterol and fat intake. For more specifics, refer to the list below, where Opti-Care shares a few dietary recommendations that can help with this eye condition. Orange-colored foods like carrots and squash contain significant amounts of beta-carotene, a precursor for the formation of vitamin A. This vitamin helps maintain healthy eyes and skin, and also reduces the risk of macular degeneration. Some literature even says it could prevent its progression. Spinach, kale and broccoli are excellent sources of lutein and zeaxanthin. These carotenoids contain antioxidants that prevent eye issues like cataracts. Plus, spinach is shown to provide a good amount of zinc and folate, both of which are necessary for preventing dry eyes. Opti-Care’s eye doctor also recommends eating deep water fish like tuna, salmon or mackerel, which are abundant in omega-3 fatty acids. Omega-3 ensures adequate moisture in your eyes, but can also help prevent macular degeneration and cataracts. They’re also great for maintaining “good” cholesterol in your body, and thus have a positive effect on your overall heart health. Common wisdom states that you should drink up to eight glasses of water a day, though no scientific literature has been found that actually accounts for this amount. Recent studies show a more specific figure of 15.5 cups (3.7 liters) of water every day for men and 11.5 cups (2.7 liters) of water for women. Of course, you should drink water as often as you can, not just when you’re thirsty. Coffee and alcohol, meanwhile, are diuretics, meaning they make you pee more often. This might dehydrate you, so avoid them for the meantime if you’re suffering from dry eyes. 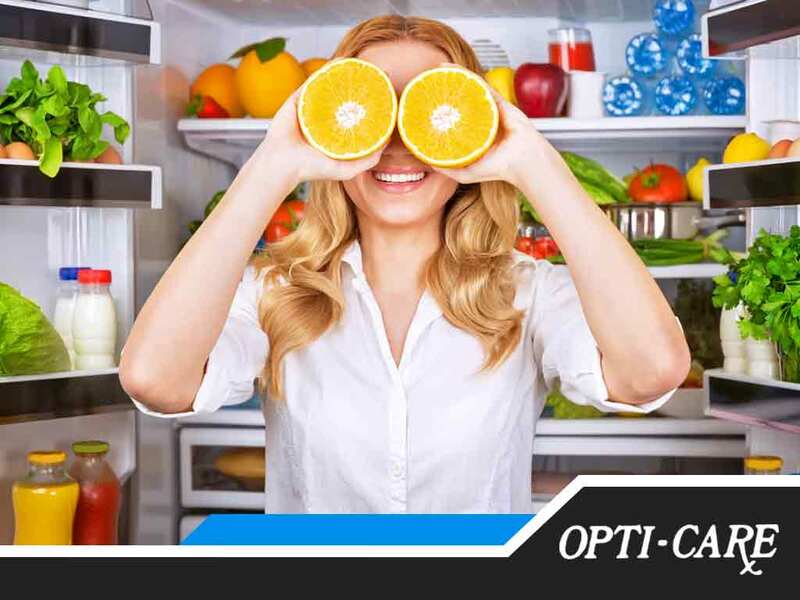 To learn more about other foods that are good for the eyes or get more information about our treatments, including eyeglasses and contact lenses, turn to Opti-Care. Feel free to contact us at (410) 600-3173 to schedule an appointment. We serve Westminster, MD, and nearby areas.